Ready to become a skilled chef right in the comfort of your own home? Both Home Chef and Green Chef can help you out! 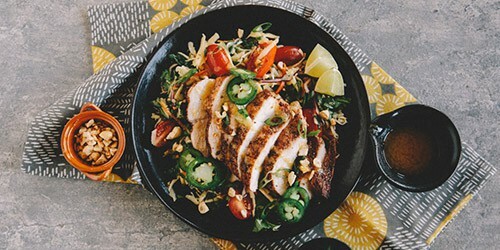 These meal delivery services provide you with fresh ingredients and detailed recipe cards so you can cook delicious meals in the comfort of your own home. No more excuses for hitting up the drive-thru 😃. If you aren’t sure which one is right for you, we’re here to help. There are a few things to consider before your purchase. To help you decide, we’re putting both Green Chef and Home Chef to a head-to-head battle. Once over, you’ll be able to choose the one that’s best for you and place your very first order. No one wants to eat the same meals over and over. That’s why variety is key when it comes to meal delivery services. On Home Chef’s menu, you’ll find a variety of different dishes to spice up your dinners. 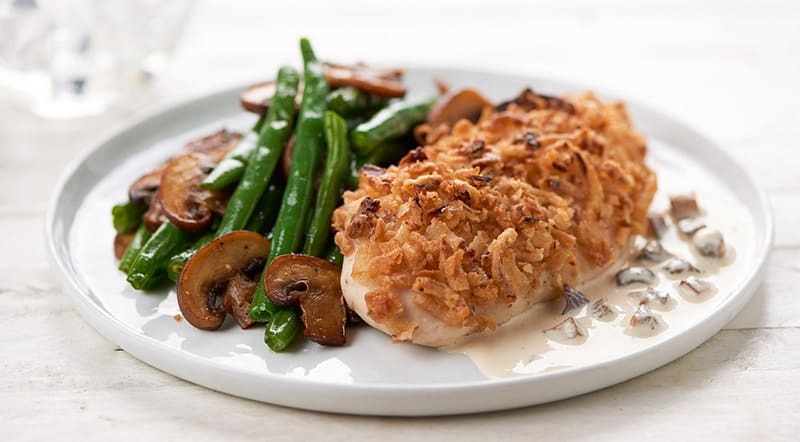 They have meals such as Roasted Garlic Butter Steak with Crispy Cheddar Potatoes, BBQ Shrimp Pizza with Pico de Gallo, Acapulco Steak Quesadillas with Cheddar-Jack Cheese and Red Onion, Lemon Thyme Chicken Orzo with Kale and Grape Tomatoes, and Turkey Tetrazzini Skillet with Cremini Mushrooms and Parmesan. Is your mouth watering yet? The one thing worth noting about Home Chef’s service is that they don’t have specific meal plans to choose from. Instead, there’s just one menu each week that contains about 16 different dishes. This means you’ll have plenty of variety, however you won’t have meal plans that are dedicated to certain dietary needs. Instead, you’ll have to inspect the ingredients of each meal to see if it fits your diet. This makes it challenging to avoid allergens and there really aren’t meals that are suitable for vegetarians or vegans. Home Chef also isn’t all about organic ingredients like Green Chef is. Occasionally their meals will have organic ingredients, but it’s not something they can guarantee for every single meal they offer. You can still count on receiving quality ingredients and they do source them responsibly whenever possible. When it comes to Green Chef, you’re actually going to have a number of meal plans to choose from. This is great because it really allows you to customize the meals based on your dietary needs and how you like to eat. 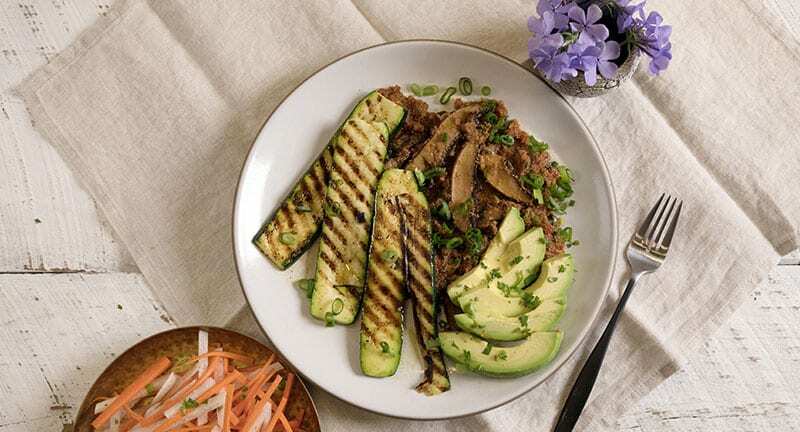 For their 2-Person Plan, you’ll have the choice of signing up for the following plans: Keto, Paleo, Heart Smart, Omnivore, Vegan, Mediterranean, Vegetarian, Gluten-Free, Lean & Clean, and Pescatarian. Plenty of choices! They also offer two meal plans for families, which are the Family Omnivore and the Family Carnivore plans. These plans are designed for a family of four and are served family-style. The best part is that they’re also going to be ready in about 30-45 minutes, which is perfect for busy parents. Now, what’s on the menu? Well, it changes every week to ensure you have plenty of variety. On their Omnivore plan, you’re going to find dishes like Rosemary-Roasted Chicken with a Kale Salad with Herb-Roasted Potato, Figs, & Pistachios, Meatballs with Chimichurri with Roasted Butternut Squash, and Rice with Red Bell Pepper, and the Dill-Roasted Salmon with Mashed Sweet Potatoes, Red Beets, & Kale with Corn. Because Green Chef is a USDA certified organic company, they pride themselves on working with farmers to source sustainable ingredients. All of their ingredients go through an extensive screening to meet their standards, so you know you’re getting only the best. We all want the most for our money. That’s why serving sizes for low prices is important to see in meal kits. At this time, Home Chef only provides customers with two servings for each meal. While this is great for those who don’t have families, it’s not going to work out for anyone with children they need to feed as well. You’d have to look for another service (like Green Chef) or fix your kids a separate meal every night that you have Home Chef. The lowest Home Chef currently charges per serving is $9.95. As mentioned above, Green Chef offers two different choices for portion sizes. There’s the 2-Person Plan, which is suitable for one or two people. If it’s just you that you’re feeding, you can save the leftovers to enjoy the next day, which is definitely a plus. However, if you have children you’d like to feed with Green Chef as well, you’ll want to go with one of the family plan options. These will get you four servings with every meal so you can feed your kids the same thing you’re having as well. The lowest Green Chef currently charges per serving is $10.99. Yes, you are going to receive pre-portioned ingredients with both Home Chef and Green Chef. Everything is already measured according to portion size and prepped before it even lands on your door. This is going to save you so much time in the kitchen because you won’t have to spend that extra time getting the ingredients ready to cook. Instead, you can dive right in and start preparing your meal! What could be better than that? Going the pre-portioned route doesn’t just save you time though. It’s also going to be great for your bank account. Far too often we’re guilty of throwing money away on ingredients that get wasted. Sometimes we have to purchase more than what we need for one recipe and many times the remainder goes to waste. Instead of throwing food out, you’re using everything that’s sent to you, which keeps more money in your pocket in the long run. 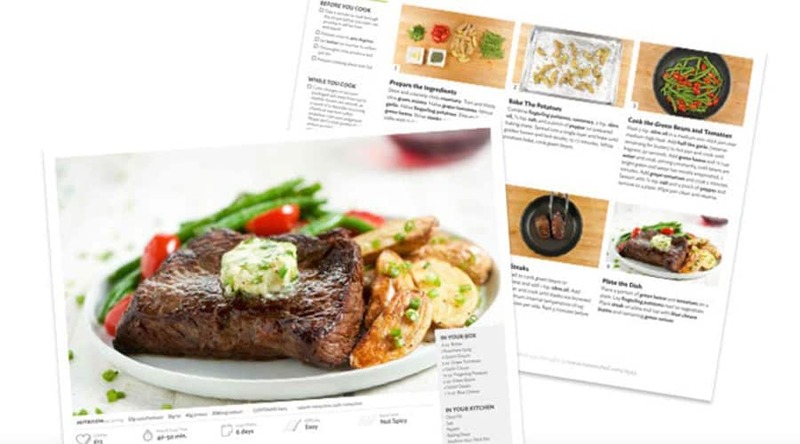 Home Chef and Green Chef make sure their customers can whip up a meal with ease thanks to detailed recipe cards. These cards list all of the ingredients, as well as the steps required to bring the meal together. You can even view all of this information online ahead of time, along with photos for every step. Being able to review the recipes before you choose your meals is great, especially if you have a busy week ahead. You can choose quicker, simpler meals if you know you have a lot going on with your schedule. Plus, both meal delivery services are suitable for the kitchen novice. You don’t need to have years of experience or be this skilled chef. Anyone can follow the recipes and cook a great meal. 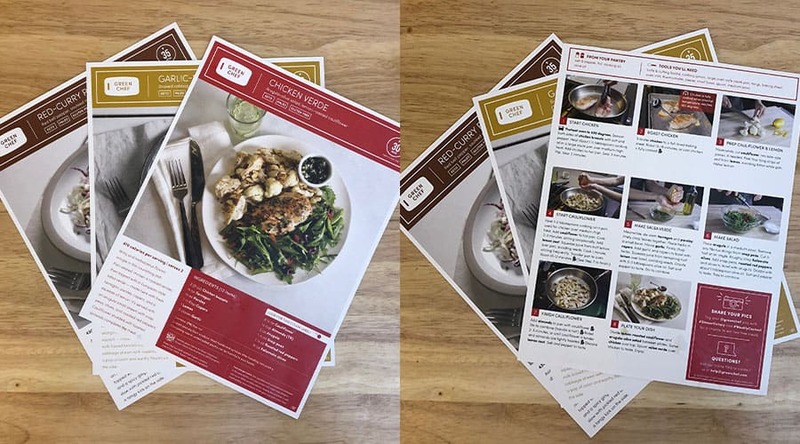 The Green Chef recipe card is also printed on heavyweight paper to ensure it doesn’t get ruined during the cooking process. How a meal kit is delivered plays a big role in how good it is. It’s also important to consider if the meal kit can even be shipped to you (some don’t deliver everywhere in the US yet). To find out if you’re in Home Chef’s delivery area, you’ll have to visit their website and put in your zip code. This will let you know immediately if they can serve you. At this time, they are able to deliver meals to 98% of the United States. When you place your first order, you’ll be able to choose your preferred delivery date based on what’s available for your location. They send deliveries Tuesday through Friday each week, so you can select the day that works best for you. And if needed, you can always change it in the future. 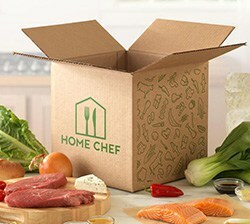 Home Chef offers free shipping for all orders over $45. Orders under $45 will be charged a $10 shipping fee. You’ll want to be aware of this when placing orders if you’re hoping to avoid the added cost for shipping. Green Chef is able to serve customers across the United States, but they’re unable to deliver to Alaska, Hawaii, and parts of Louisiana. If you’re not currently in their delivery area, you can still sign-up and they’ll let you know as soon as they’re able to deliver meals to you. For those able to join Green Chef, you can expect your order to arrive between 8 AM and 9 PM on your scheduled delivery day. Boxes are delivered Monday through Saturday and you’ll be able to choose from available delivery dates based on your location. This is designed to make it even more convenient for you so you can have your meals delivered whenever you like. You don’t have to be home though, as the carrier will leave the box outside your home and you’re always able to track its location. When it comes to shipping costs, there’s a flat fee of $6.99 per box. Meal kit packaging ensures that your ingredients don’t spoil or get damaged while in transit. Also, how a box is packaged plays a role in how recyclable it is when it needs to be thrown away. 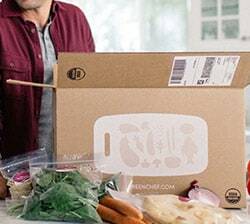 Home Chef uses green packaging to keep your ingredients fresh during transit while also doing their part to minimize their carbon footprint. Your order will be packed inside a box that’s biodegradable and insulated. The boxes are made from partially recycled cardboard and can be recycled curbside. Their insulated liners are made from recycled cotton and denim. There are some plastic packaging materials, such as their plastic produce bags and plastic containers. All of these can be recycled. You can reuse the ice packs or drain them in the trash and recycled the film at recycling facilities that accept plastic bags. With a name like Green Chef, it should come as no surprise that they use eco-friendly packaging to ship orders to their customers. Everything is made from recyclable, reusable, and/or compostable materials. Their cardboard boxes are made of corrugated cardboard with a minimum of 40% recycled content. The insulation is made from a corn-based insulating material. Both of these can be recycled through your local curbside recycling program. Their ice packs can be reused if desired or you can drain the non-toxic gel into the garbage, rinse the bag, and recycle it at a facility that accepts #4 plastic. Green Chef also uses other packing materials like paper bags, plastic bags, small paperboard boxes, and egg cartons, over plastic materials (when possible). All of which can be recycled and they encourage you to do your part in preserving the environment. No matter what happens, you want to make sure that you’re covered. Having a money back or satisfaction guarantee is an important part of meal delivery customer service. If there’s a defective product or anything wrong with your Home Chef box, don’t panic! Get in touch with their customer service team and they’ll do what they can to make the situation right. Home Chef will either give you a credit toward a future purchase or give you a refund. However, if it’s only part of a product that’s defective, they’ll determine if you’re eligible for a refund and for how much. Green Chef doesn’t have a money back guarantee clearly stated on their website. If there are any issues with your box, the best thing you can do is to get in touch with them as soon as possible and voice your concerns. You don’t want to wait too long before reaching out to the Green Chef team. There is a possibility there customer support team will remedy the situation. However, it’s just not outright listed on their website. Sometimes questions will arise. It’s important you can get in touch with someone who will be able to help you. Need to get in touch with Home Chef? Well, you’ll have two options. You can choose to submit a support ticket via their website, in which they’ll get back to you via email. Or you can pick up the phone and give them a call. Their customer support lines are open Monday to Friday from 9am to 6pm CST, Saturday from 10am to 2pm CST, and they are closed on Sunday. The best way to reach the Green Chef team is through email or by telephone. They have a dedicated customer service email to field any questions or complaints from subscribers. There’s also a phone number where you can reach someone during business hours Monday through Saturday. Their office is closed on Sunday, so you won’t be able to reach anyone then. If you made it all the way through this comparison, you’ll notice there were a lot of ties between Green Chef and Home Chef. This is because, as a meal delivery service, they are both relatively similar. However, where they really differ is in their meals. If meal variety is important to you, try Green Chef. They have a ton of different meal plans to fit your taste and dietary preferences. The same goes for health — Green Chef prioritizes healthy and organic meal options. On the other side, if you prefer your meals to be tasty, quick to make, and inexpensive, try Home Chef. Both are great options and have made our list of the top meal delivery services available so you can’t go wrong with either.